I just watched the movie Boy A on TMNonDemand. I have to say it’s one of the best movies I’ve seen in a long time. It’s not a big budget movie by any means, the actors are relatively unknown. But the plot is brilliant and everything is so remarkably real, it’s unnerving. 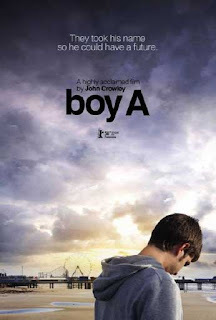 The movie is about a boy who was involved in a murder when he was young, and has been in prison since then. He’s released when he turns 21, and given a new identity so he can reintegrate into society. The story was tragic and beautiful, but the best part of the movie was the character of Jack. The actor did a brilliant job, Jack was so sweet and shy and conflicted. The portrayal of him was so multifaceted, it was really quite brilliant. I don’t often blog about movies, because I tend to have horrible taste in them. But I guarantee that even those of you who have good taste in movies will enjoy this one. And possibly cry, like me. Told you it was good! Very sad though. Definitely not one to watch by yourself right before bed…at least, for me. It sounds very promising Hezabelle! I like reading about movies on the blogs. It’s so much better than relying on some Very Important Critics’ opinions whose taste is quite often different from the “normal” people’s. Thanks! You should see “Yes, man”. I saw it on Friday and it’s very good! I’ll definitely have to watch this!